This CD is only for genuine lovers of singers with magnificent voices and, contrary to what many may say, these are very rare. 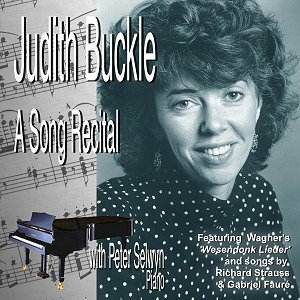 We have been privileged to have a few outstanding sopranos such as Geraldine Farrar, Helen Traubel, Frida Leider, Kirsten Flagstad, Brigit Nielsen, Joan Sutherland, Maria Callas, Jessye Norman and now Judith Buckle. What a voice she has. Her intonation is faultless; her range is secure throughout and she seems to have a new voice for each composer. Her voice never becomes familiar or predictable. One cannot help but listen and admire. For those of us who love the human voice we are painfully fussy about its quality, production, projection and intonation. The interpretation of songs is never an easy matter and to communicate them with conviction evoking a response of sheer pleasure and that rare personal profound satisfaction of music is almost unheard of. All these vastly desirable attributes are in Miss Buckle's singing. To add to this, many famous sopranos have ghastly musical habits which range from ugly portamenti to obnoxious showing off. Take, for example, Richard Strauss's glorious Zueignung. It has the right pose, the right tempo and the sheer beauty of the voice is, quite frankly, beyond words. Wagner may be the greatest composer for the voice. After listening to this very moving account of the Wesendock Lieder it would take some convincing to refute that claim. I have never heard them sung better and I have 40 recordings. The songs are not just sung ... they are lived. Her repertoire ranges over 300 years and Miss Buckle is comfortable in all styles. And when a performer makes you listen to music you may not admire at all it must say something for their musical gifts. The Frank Bridge songs are welcome. Love went a-Riding is a stunning piece which, incidentally, requires a pianist with a cool head and steel fingers. I shall never forget another great singer, the incomparable Sybil Michelow, a contralto, singing this song and accompanying herself at the piano! The final song on the disc causes me to respond by suggesting that we do send Miss Buckle flowers as a small appreciation of allowing us to share something very special ... and rare.